Mobile users are growing day by day and Google is taking no risks in educating its users the right skills to maintain a mobile friendly site. Recently, in partnership with Answer Bag, Google studied the behaviour of more than 100 mobile users as they participated in conversion focused tasks. Calls to Actions plays a key role in converting visitors into customers so keep your CTA buttons in an area where the users are most likely to click. Unlike desktop users, mobile users lack huge display area and speed both. Hence, it is recommended to have short and sweet menus that makes it easier for the user to navigate your site. It is really confusing for the mobile user to navigate through the site if they don't find an easy navigation to return to the home page. 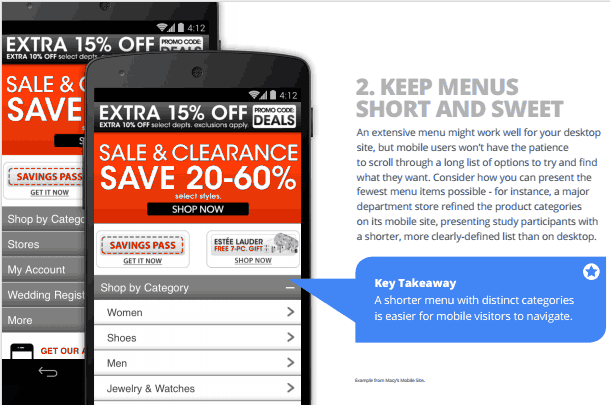 Keep the home page button visible for the user from every pages of your mobile site. This will provide an option to the user to return to the home page whenever they feel doing so. Ads although contribute towards revenue but they should not disturb the overall user experience. Make sure, the Call to Actions buttons are always visible and are not overshadowed by ads and promotions. Site search is an extremely user friendly component of both the desktop as well as mobile site. 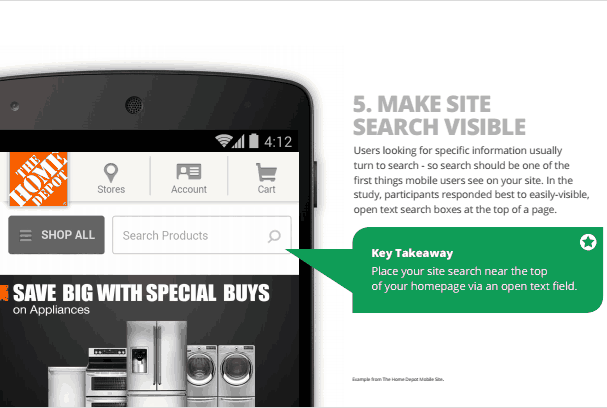 Provide site search option on your mobile site and make it easily visible. I have seen over and over again, that the algorithms used for site search are often inaccurate and returns inappropriate results. Make sure, the site search option in your mobile site returns accurate results in order to enhance the overall user experience. Filtering in order to narrow down search results helps the user to find the most relevant search results. Relevancy in return increases conversion. If you are a major online retailer then you might ask questions like gender before proceeding towards filtering. This will guide the users to return more accurate search results. Asking for registration as soon as the user enters the site is not counted as a good user experience. Have patience, make the user check our your site as much as he can, then if the user loves the site, he will surely register for it. But, make sure do not force the user to register. 10- Encourage "Checkout as a Guest"
Many users are not convinced for registration so allow users to "check out as a guest". This will help in some extra conversions. If you are using a third party payment gateway then make it convenient for the users to quickly fill up the form by automatically filling the information you already have. Make it easy for the customers to call the customer service agents by offering easy click to call buttons. Often the mobile users use their mobile devices to research and use the desktops to buy online. In that case, make it easier for the users to save their choices on their carts to resume their purchasing journey once they login using a desktop. It is recommended to display number keys at the time of form filling to allow easier filling of forms. Make it easy for the user to fill up the form. Use drop downs and check boxes so that the users are able to fill the form by choosing available options rather than filling it. This will save time and make it convenient for the user to make a purchase. 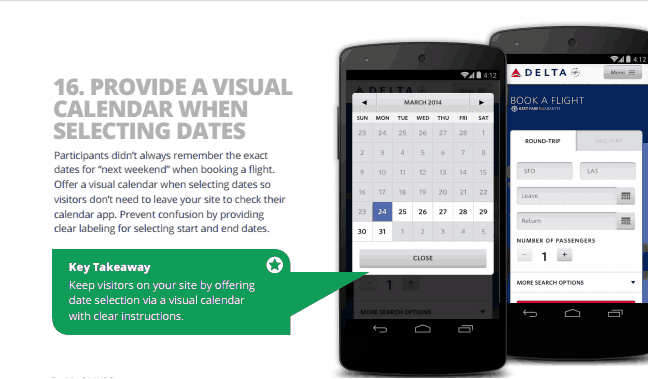 Similarly when choosing dates, provide a visual calender. This will stop the user from manually entering the date and the overall user experience would be optimized. If the users are making errors while filling up the forms then instead of accepting wrong values, display labels and apply real time validation. This will allow the users to know that there is a problem in the form. Make the form as short as possible and use auto-fills to enable faster filling. The overall site design should be mobile friendly. Customers like to see images before they buy any product. Therefore, it is recommended to include high quality close up of images. Participants included in the test were frustrated if they needed to zoom in and out the images. 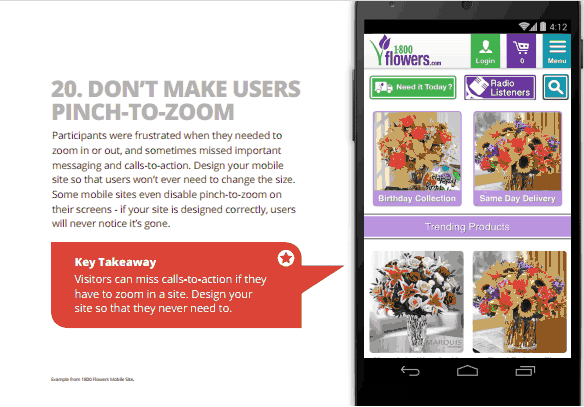 So, avoid using zooms as this negatively affect the conversion rate. Sometimes due to the compact mobile screen, a certain screen orientation might work best. Suggest to users the best screen orientation as this will help the users to properly navigate your site. Do not open multiple browser windows in order to make the user click on the CTA button. Users hate to browse several windows before they reach the CTA button. Hence, include CTA buttons in the same browser window. Many webmasters made the mistake of providing both the mobile and desktop site links. This made the users click on the full site link (desktop one) therefore disturbing the overall user experience. Some websites automatically detect users location and show them the deals which are annoying. Instead, a better approach is to tell the user that you have automatically detected the location and how that information will further enhance the experience.